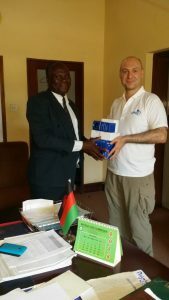 During the recent visit to Malawi for UAV testing at the UNICEF drone corridor, co-founders Daniel Ronen and James Ronen made donations, on behalf of UAVAid, of a range of goods to support education and childhood welfare in the local Kasungu community. With 50% of the population living below the poverty line, Malawi is widely recognised as one of the poorest countries in the world (IMF 2017). It suffers from low indexes of education, health and life expectancy and is a priority country for aid from the UK. 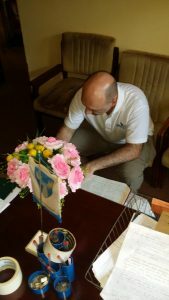 Daniel presented the items to the Deputy Principal of the Kasungu Teacher Training College, for distribution to the children in the adjoining primary school, before being honoured with a request to sign the visitors book. Daniel Ronen presenting stationary to the college’s Deputy Principal for distribution to the local primary school.